Decide how to handle feedback in your class and choose your settings. Critique: This is a more formal, structured critique work of others in the class. It will appear in 'Deadlines' or under the 'Critiques' tab, and be viewable by the class (depending on your setting). Continue reading below to learn a bit more about each type of feedback. You can select text in a writing response and comment on just that selected text -- much like you could do on a written manuscript. Other people can also add comments in response to your feedback or create new comments of their own. You will also be able to highlight the text. As an instructor, you can set predetermined highlighters for your class, but you can also make unique ones just for your use. 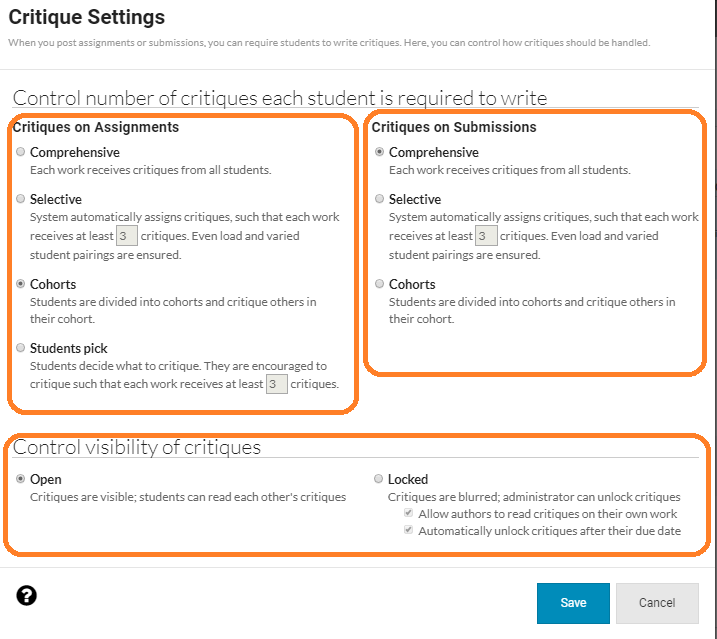 Please note: Assignment and Submissions can have different critique settings. When viewing a student assignments or submissions , you will see a large, blue box with an 'Add Private Feedback' button. Everything in your class can be commented on. That includes assignments, works, critiques, discussions, etc. For example, you can comment on a critique to continue a conversation around someone’s feedback. You can also comment on answers people might have given to questions embedded in lessons.